Valentine was probably a Christian martyr in Ancient Rome, but there may have been two Valentines. One was a priest put to death on the orders of the Roman Emperor on the Flammian Way at Rome in the 4th century. Another was Bishop of Terni, in Umbria in Italy. Possibly the 2 stories have become combined. There is also a female St Valentina, a virgin martyred in Palestine on July 25th AD 308. These legends do not explain the link with the custom of choosing a partner and sending ‘Valentines’. The Dictionary of Saints concludes that this tradition apparently arose from the old idea that birds begin to pair on 14th February, but that there may be ‘a more remote pagan significance’. When every bird comes to choose his mate). St Valentine was not necessarily commemorated on February 14th during the 14th century. Chaucer may have written this tale to celebrate the marriage of King Richard II, who ruled from 1377 to 1399, and his first wife, Anne of Bohemia. Both were aged 15 to 16, when Richard II married Anne, in Westminster Abbey on 20th January 1382, where they were both crowned 2 days later. In St Swithun’s church, there are many monuments to couples who wished to be remembered together after their deaths. 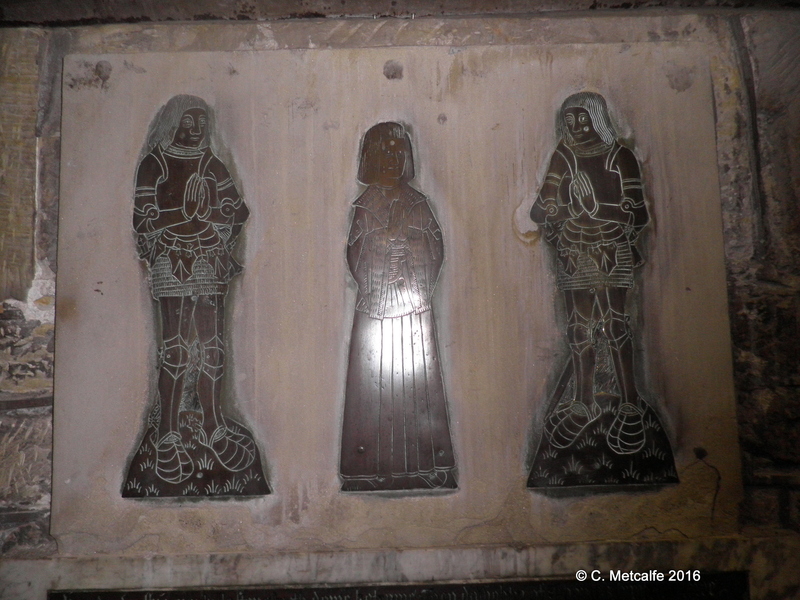 The oldest is the monument with rescued fragments of the fifteenth-century monument to Dame Kathryn Grey and her two husbands, Sir Thomas Grey, knight and banneret, and Richard Lewkenor, Esquire of Brambletye. Katherine’s second husband gave lands to pay for a chantry priest to sing masses for the souls of the dead, and requested the founding of an almshouse for three poor men. Katherine wished the almshouse to be completed and wanted her monument to display her own coat of arms with those of her two husbands.